The Ta’an Kwäch’än Council is one of the Yukon First Nations who possesses proof of its long-standing land claim with the Government of Canada. Chief Jim Boss, with the aid of a lawyer, wrote a letter to the Superintendent General of Indian Affairs in Ottawa in 1902, claiming that Yukon First Nations were in need of a settlement because of the loss of lands and depletion of game with the gold rush and subsequent settlement by outsiders. At the time, the Ta’an Kwäch’än were granted a small reserve in their traditional territory at Lake Laberge. 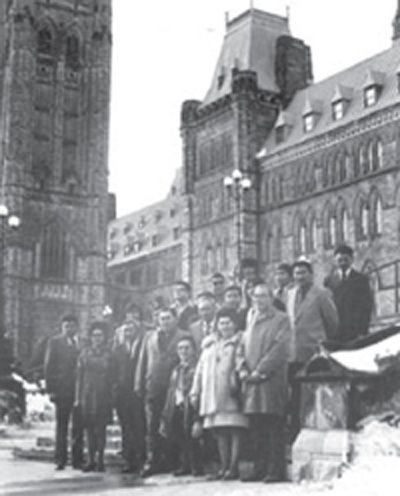 The vision of Chief Jim Boss finally culminated in the beginning of negotiations many decades later in 1973. The Government of Canada, the Government of Yukon and the Council for Yukon Indians sign the Yukon Umbrella Final Agreement, which lists the Ta’an Kwäch’än Council as a separate First Nation entity that would negotiate separate final and self-government agreements. A negotiator’s Memorandum of Understanding acknowledging completion of the Ta’an Kwäch’än settlement is signed between the Government of Canada, the Government of Yukon and the Ta’an Kwäch’än Council. The Memorandum of Understanding is subject to a list of outstanding matters, including the separation of the Ta’an Kwäch’än Council from the Kwanlin Dün First Nation and the resolution of overlapping traditional territories and settlement land selections. The Ta’an Kwäch’än becomes a recognized Indian Act (Canada) band separate from the Kwanlin Dün First Nation. The Ta’an Kwäch’än Council and the Kwanlin Dün First Nation reach a mutual resolution on their settlement land selections picked from the same traditional territory. That same month, negotiators initial a negotiators’ memorandum marking the conclusion of Ta’an Kwäch’än Council’s land claim negotiations. Negotiators initial the Ta’an Kwäch’än Council final and self-government agreements and recommend the agreements to the principals for ratification. The Ta’an Kwäch’än Council holds a vote to approve the ratification of the Ta’an Kwäch’än Council’s final and self-government agreements. A signing ceremony of the Ta’an Kwäch’än Council final and self- government agreements and implementation plans takes place. This significant event marks the 100th anniversary of Chief Jim Boss’s letter to the Government of Canada. The Ta’an Kwäch’än Council is the eighth Yukon First Nation to sign its land claim and self-government agreements.